I have always been intrigued about Reflexology even though I had no clue what it actually was or what it entailed. Someone touching your feet was pretty much my entire knowledge base on Reflexology, so I wanted to find out more. For the past year or so I have had horrible stomach issues, partly due to lactose intolerance but mainly due to issues with stomach acid. I was given tablets from the doctors but I really wanted to find natural remedies to control these issues. I will have a post up soon all about the right foods to eat if you suffer from stomach issues so keep an eye out for that. 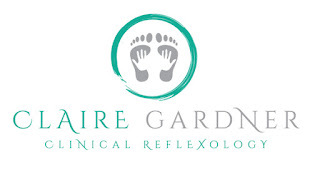 I found reflexologist Claire Gardner on a #NorthEastHour twitter chat and decided to jump in feet first (pun intended) and book my first session of Reflexology. Claire specialises in fertility which isn't something I am interested in right now, but I it's good to know for the future. I have polycystic ovaries so even though we have no plans to start a family right now I might have issues in the future and it's fascinating what Claire can do around this subject, so if you have any concerns around fertility get in touch with her. She also works on newborns, elderly people, women and men. 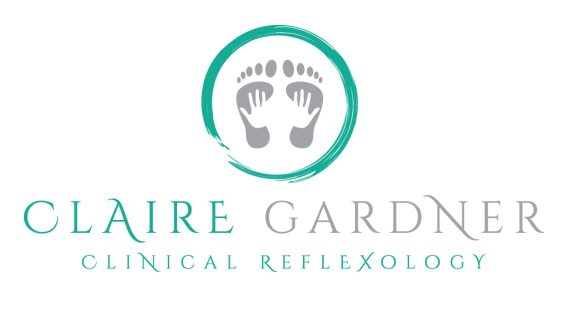 Reflexology is a holistic therapy that has been around for centuries from ancient Chinese and Egyptian cultures, then being introduced into the Western World in 1913. In simple terms, there are particular reflex points on the feet that have been found to correspond and match other areas around the body. Your reflexologist will massage these points on your feet helping to minimise or even stop pain, illnesses or discomfort. The best place to look for the in's and out's of reflexology is the Association of Reflexologists. This post will let you know all about my experience with Reflexology, how it helped me and how it could help you. I had done a little more research on Reflexology before my first session so even though I was nervous I was also excited to see if it could actually help my body by massaging pressure points on my feet. Claire is so lovely and instantly makes you feel very calm and relaxed with her soothing voice. I sat down on a chair covered in a soft fleece which felt amazing and Claire went through my initial consultations. Claire asked me all about my health, sleeping habits, symptoms I was having, and talked about different parts of the body and what I wanted to get out of the sessions. I let her know about my stomach issues and a few other things I was hopeful would be improved by this treatment. After the consultation Claire reclined me in the chair I was sat in so my feet were slightly in the air. OMG, I need one of these chairs at home, it was the comfiest chair ever. She then put a pillow under my legs and covered me in another fluffy fleece, turned the lights down, put on some spa music and I was in heaven. I was a little apprehensive about someone touching my feet as I have the most ticklish feet ever, but the pressure is very different so this was never an issue. Claire starts by wiping your feet with a wet wipe, which in itself is very soothing, she then covers one foot with a towel while she works on the other. The techniques she uses are hard to describe but it feels like a full body massage for your feet. I made a joke about how I could just fall asleep, which transpired was not a joke as this is what I did at every session. The day after the first session I did feel like I had actually had a full body massage, it was extremely strange in a good way and I was excited to go back so I set up weekly sessions with Claire. Each session would start the same, a quick chat about how I felt after the last session and how I was feeling that day. Sometimes I would go in with a headache so this made Claire aware to not put too much pressure on my brain (which is in the big toe apparently). I tried my best to stay awake so I could see the types of movements and techniques she was using but my body just gave in to the relaxation. That is one thing I will say if you have no medical need to see a reflexologist just do it for an hour of bliss that isn't as messy as a full body massage but gives you all the same benefits in my opinion. The day after each session I definitely felt a spike in energy and, as I said previously, less tense in my back and shoulders. In one session without even telling Claire she knew I had been suffering from a sore throat; during the 4 weeks I'd had my treatments I felt like I was getting the starting symptoms of a cold that just never fully showed, I think this is due to the Reflexology stopping it from happening. Claire nearly fell off her chair when I told her my usual bed time is between midnight and 1am. I have always been a night owl and I will never change that I don't think, but I used to struggle with falling asleep no matter what time I went to bed. After 5 weeks of Reflexology, I did notice that I was falling asleep much quicker and staying asleep all night until my alarm went off. This was giving me more energy as I was getting a much better quality of sleep. This was something I didn't even realise would be helped with Reflexology. My husband Thom will 100% testify to the fact that I get awful PMT; I get so angry and irritable, it was becoming a real issue but I wasn't sure if it was just due to my PCOS. However, while I was having Reflexology I noticed a massive difference in this and I mean massive, to the point where I didn't even realise I was due on my period as I had had no PMT. It was amazing and I can only contribute this to having Reflexology. This may be TMI but I am all about sharing on this blog, lol! My stomach issues were the main reason I wanted to try Reflexology, after about 3 sessions I noticed I was going to the toilet more regularly and was in less pain. Claire noticed this getting better as well over each session, I would feel less bloated and even my heartburn felt like it was getting better as I was relying less on Rennies or Gaviscon. I was really happy about this as it felt like it was just never going to feel better. These days I do get mild anxiety, a shortness of breath or that panicky feeling I can't explain a lot less then I use to get but still it isn't nice. Just by having these sessions I have felt calmer and less uptight. This is probably due to the relaxing nature of Reflexology however it is known that the toxins released by Reflexology can combat stress, anxiety and depression. My energy levels definitely increased after a session and the days following, obviously Reflexology can't be a cure for me having little energy due to late nights or eating the wrong food but it gave me a boost to want to then eat a bit better, get some exercise and a little more sleep. Reflexology can not rehydrate your body, however, if Claire mentioned in a session I was dehydrated it made me want to drink more water. I am terrible at remembering to drink water but I think someone actually telling you "you are dehydrated" makes you remember. I also wanted to see if she noticed the difference and she did. In conclusion, I am so happy I discovered Reflexology and that I did more than just one session. It is cheaper than a full body massage and even though you would have it more regularly the health benefits it brings can really change your life and I totally stand by that from my own experience. I will be continuing with sessions. You can find all of Claire's contact info on the below link.